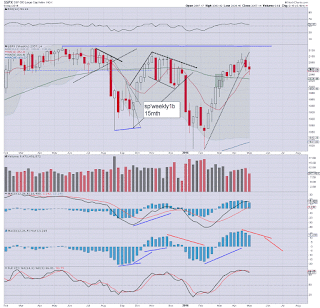 Whilst US equity indexes saw a second consecutive net weekly decline, the giant monthly cycles highlight how the market remains stuck under the winter 2014/summer 2015 highs. A fierce battle continues in the market, between the bull maniacs who are seeking new historic highs, and the doomer bears who should be targeting the sp'1600/1500s. Without getting lost in the minor day to day (or even week to week) noise... what can be said about the broader picture? First, the market remains broadly stuck since the May 2015 high of 2134. 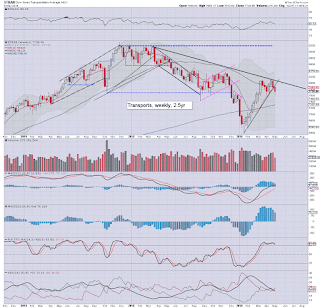 The bulls pushed hard into Dec'2015, but stalled, resulting in a fractional new multi-year low of 1810. Underlying MACD (blue bar histogram) continues to tick higher for a third month. At the current rate, there is the possibility of a bullish cross in July. However, if the market can't resume pushing higher, the next failure will result in another strong multi-week down wave, at least back to the low sp'1800s. In theory, if price structure in the sp'500 is indeed a head/shoulders formation (see weekly charts in previous post), the downside target would be a natural sp'1600. 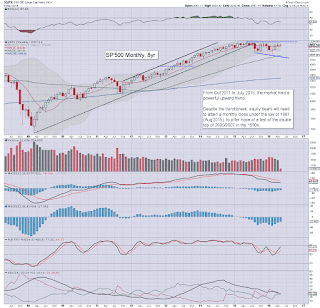 Best guess: regardless of any near term chop, increasing weakness into late May... with a monthly close in the 1950/00 zone. That should clarify that June will see the 1800s.. if not the 1700s. Of course, any break >2111 should spook most bears out of their positions, and any move >2134 would bode for much higher levels into year end. 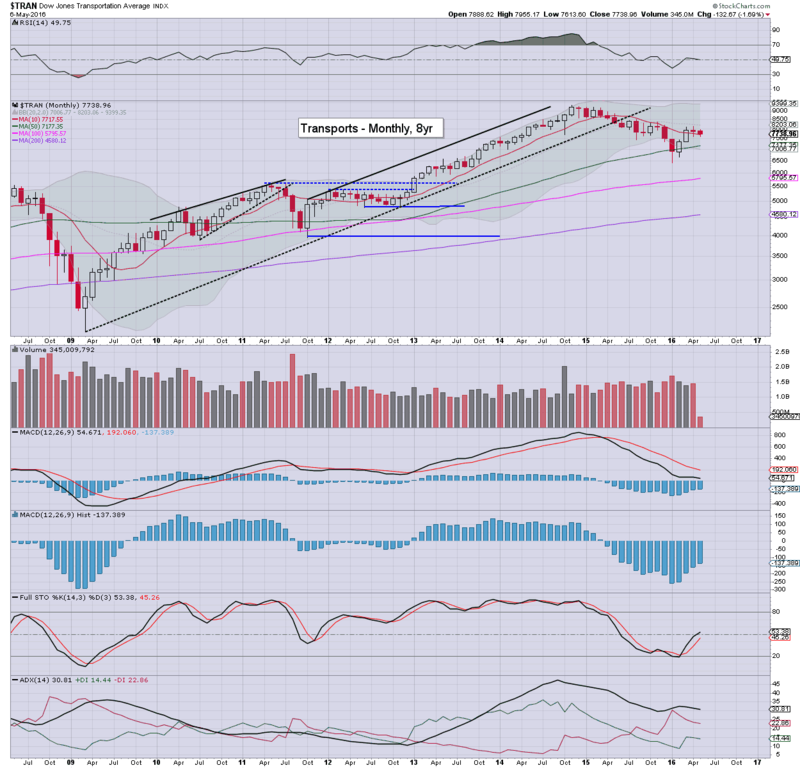 The tech' remains particularly weak, with 4 of the last 5 monthly candles net lower. 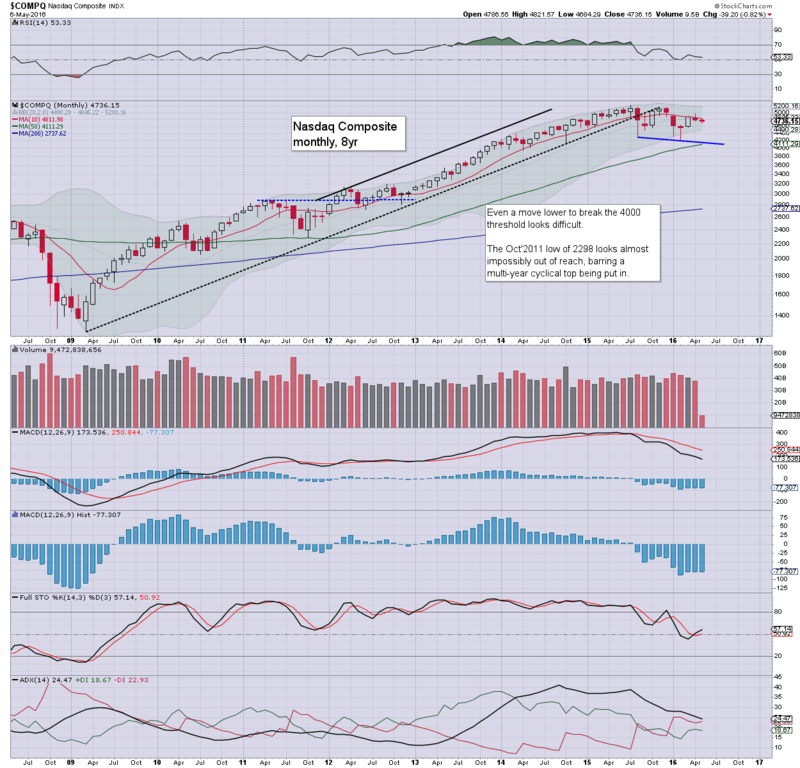 The Nasdaq comp' is currently trading a little under the key 10MA of 4811. The big 5K threshold looks out of range in the near term. 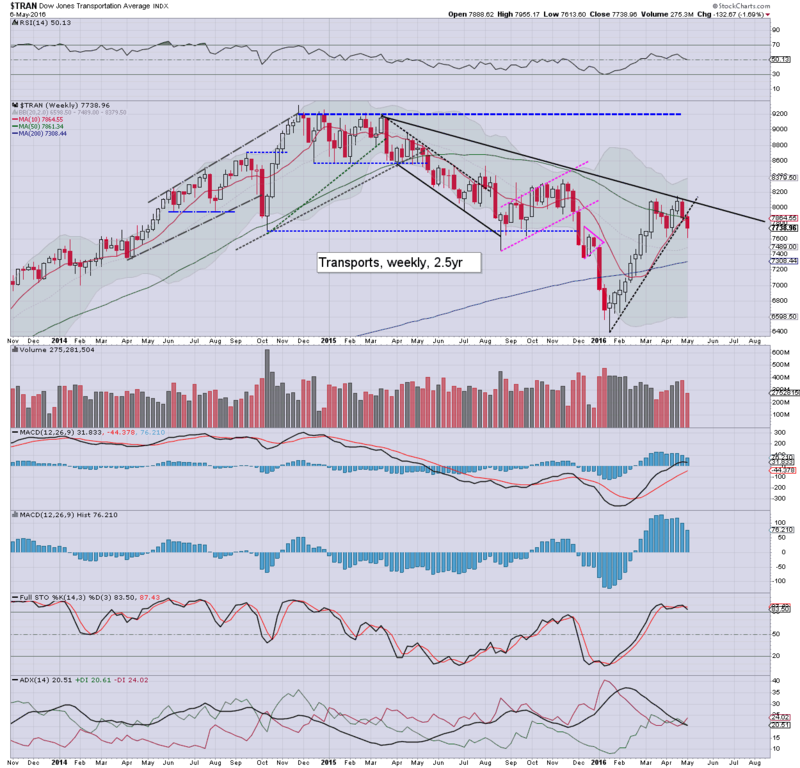 First downside target are the 4500s, with 4200/4000 viable in June. 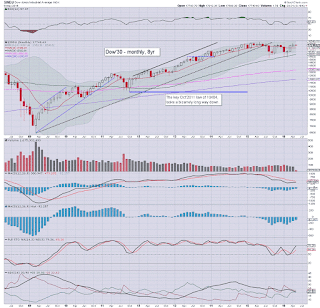 The mighty Dow remains unable to attain a monthly close above the key 18K threshold. 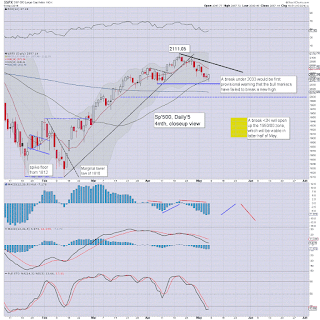 Equity bears should be seeking a break back under 17K by end May. 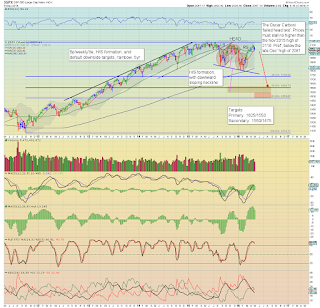 From there.. next level are the 16500s, then the Aug'2015 low of 15370. 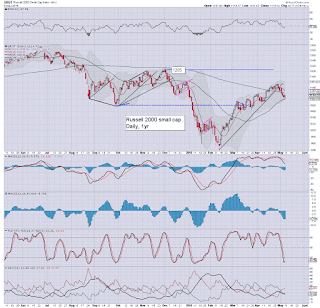 The master index has seen a powerful rally from the 8900s to the 10500s. However, its starting to rollover, with the key 10MA at 10113. The 10K threshold should be first big target by end month, from there 9500, and eventually 8K - which would likely equate to sp'1600s. 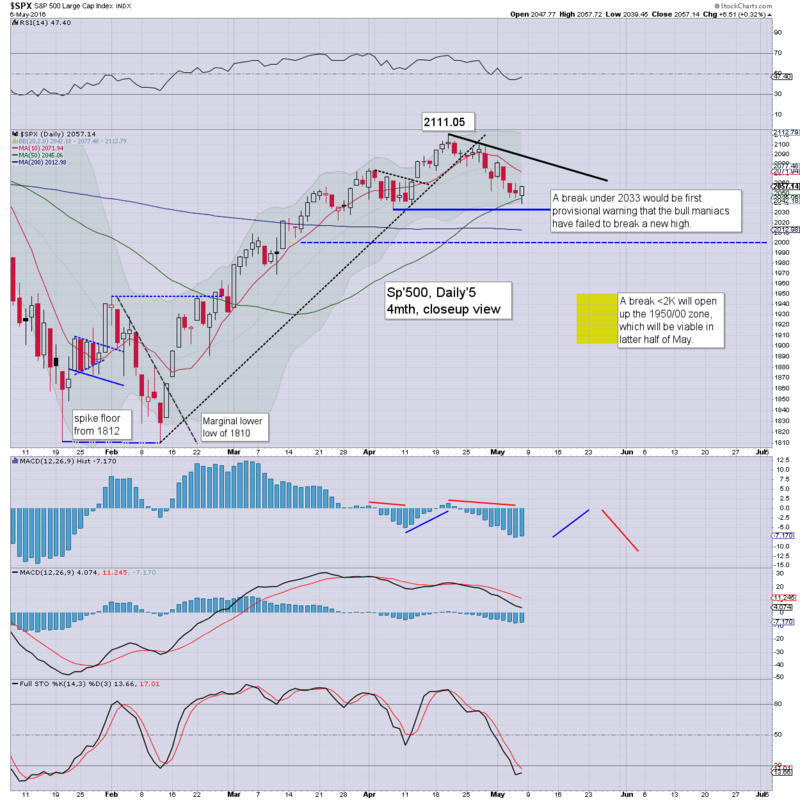 The second market leader - R2K, remains firmly stuck around the 10MA (1118). 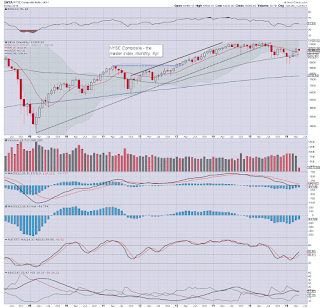 Equity bulls can't get confident again until a monthly close in the 1200s, and right now, that looks out of range. Bears should be seeking 1050/25 zone by end May. 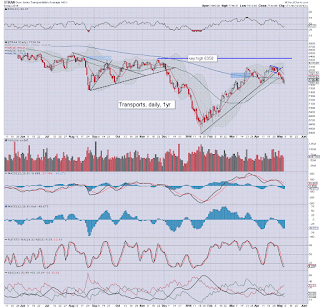 The 'old leader' - Transports, is so far still unable to re-take the 8K threshold, and is trading around the key 10MA of 7717. 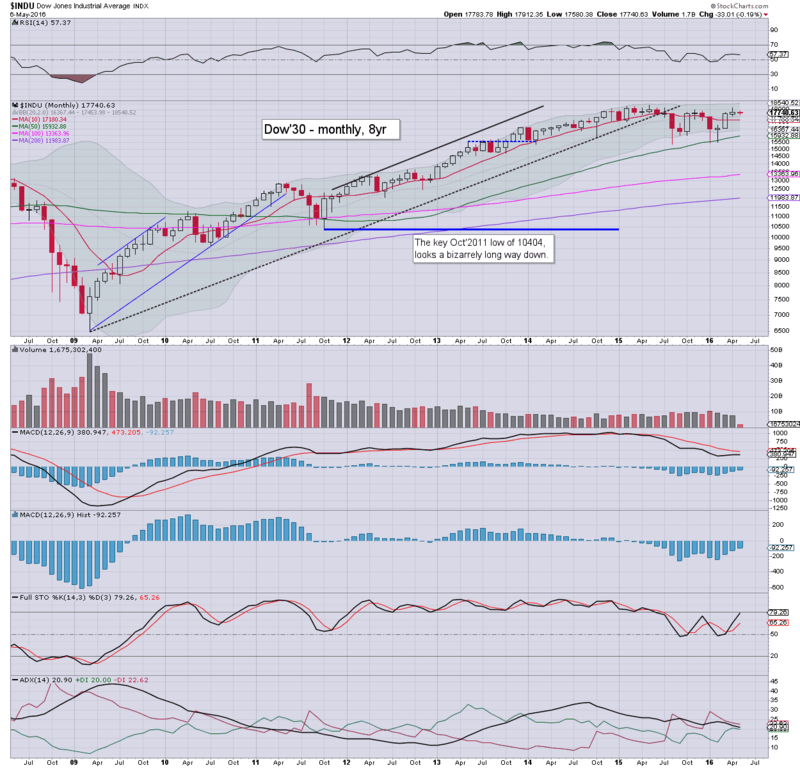 Equity bears should be seeking a May close around 7K. 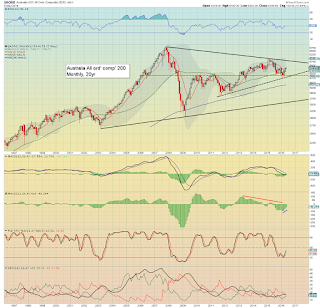 If broader market upset this summer/autumn, the 5500/5000 zone is a valid target. First, it should be clear that the US - along with most other world markets, remains broadly stuck since indexes maxed out in late 2014 (lead by the Transports) to summer 2015 (Nasdaq last to peak). The market has seen two strong down waves, in Aug'2015 and Jan/Feb' 2016. Both times, the market rallied strongly.. but has been unable to keep pushing higher. Price structure on many stocks.. and some indexes, is a viable H/S formation. By definition, if the market sees another major wave lower, it should at least test the recent lows, and eventually (after a few weeks of strong chop).. break lower by a further 10%. Renewed weakness in commodities.. especially Oil/Nat' gas. Corp' profits.. even in the once relentessly strong intl' giants like AAPL. Growth/production... is at least 'moderately weak'. Geo-political issues: Brazil - Rousseff impeachment, Olympic issues, ZIKA. BREXIT vote (June 23rd). Many now recognise the Fed will NOT raise rates at the June FOMC meeting ahead of the UK vote. Neither will they raise them ahead of the US election. That merely leaves the Dec' meeting for a second 25bps increase.... and that assumes the US hasn't slipped into a recession... or the market hasn't imploded to the sp'1600/1500s. By definition, no rate hikes is bullish for market confidence, but such upside inclination will likely be fully negated by underlying economic weakness.. or by any geo-political event. There is little of significance scheduled. *there is a sprinkling of fed officials across the week, notably Kashkari on Monday afternoon. 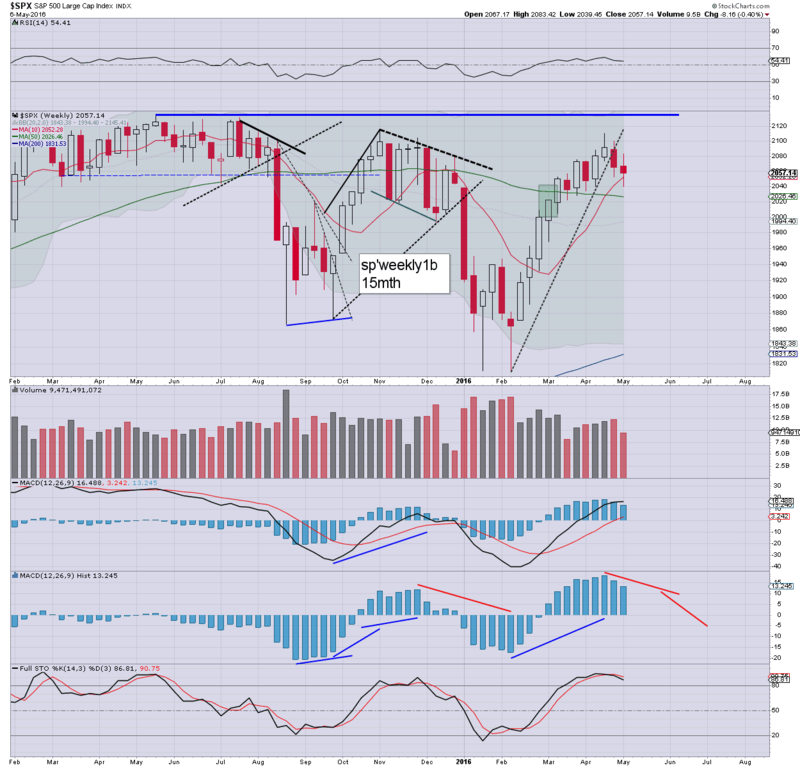 It was a messy end to the week, with the sp'500 breaking to 2039, a latter day bounce, settling +6pts @ 2057. Despite the Friday gains, all US indexes saw net weekly declines, with the sp -8pts (0.4%), but with more sig' weakness in the Trans, -132pts (1.7%). Suffice to add... a pretty messy end to what was a moderately bearish week. From a pure cyclical perspective, the bigger weekly cycles are on the high side, and in theory... should see increasing weakness into June. First realistic opportunity for significant and sustained downside looks to be in the last week of May. 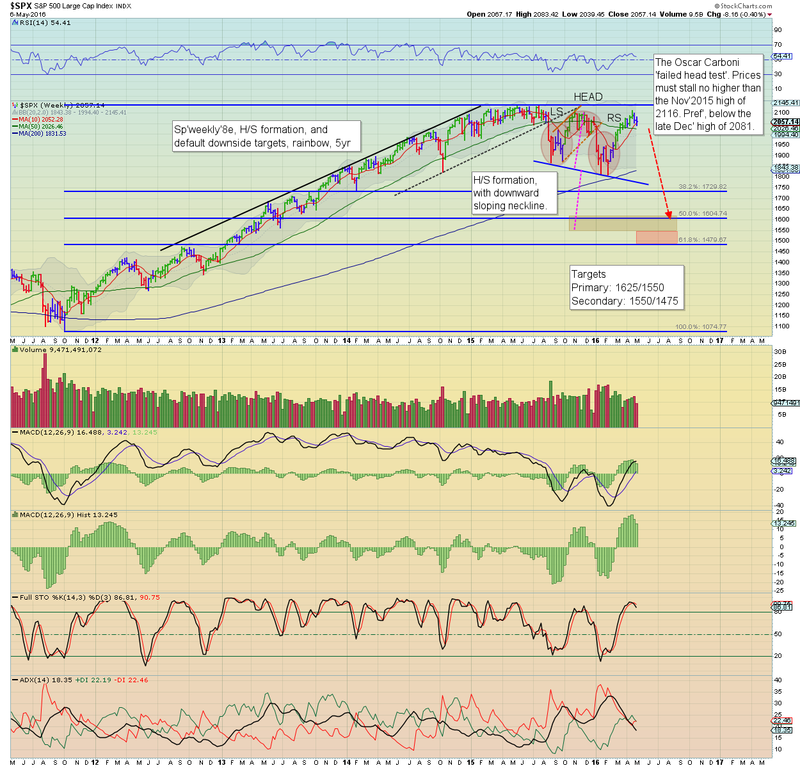 ... downside to the sp'1600 threshold would be the natural target. 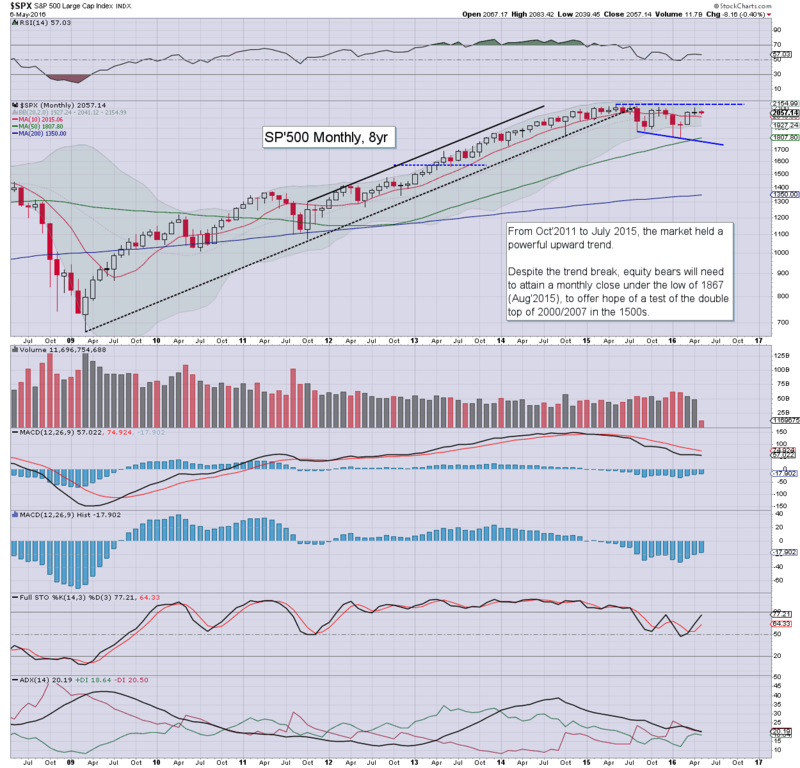 I am still of the view that the sp'500 will never trade under 1500 again. Not least as the central banks remain on standby to initiate more QE, and next time, it could include buying student debt and actual stocks. The Australian market is not one I've looked at before. Most would probably be aware that the Australian economy is heavily reliant on the mining sector, which has had massive problems since the secondary commodity peak in spring 2011. From a technical perspective, the Aus' market has been broadly stuck for over three years. Equity bulls need a break >6K to have confidence. 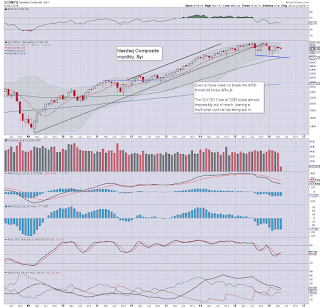 Equity bears need <5K.. which would open up the 4000/3750 zone in late summer/autumn. My view is that commodities (especially Oil and copper) remain highly vulnerable to renewed downside, and that will particularly affect the Aus' economy. Further, there is a property bubble, one which when it breaks.. will cause all manner of problems. So... look for 6k.. or sub 5K in the months ahead... and I'll hold to the latter. US equity indexes closed moderately higher, sp +6pts @ 2057 (intra low 2039). The two leaders - Trans/R2K, settled higher by 0.9% and 0.6% respectively. 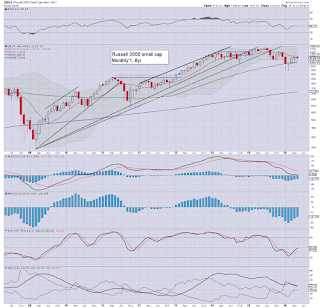 Near term outlook is borderline, but remains broadly bearish unless a break >2080. 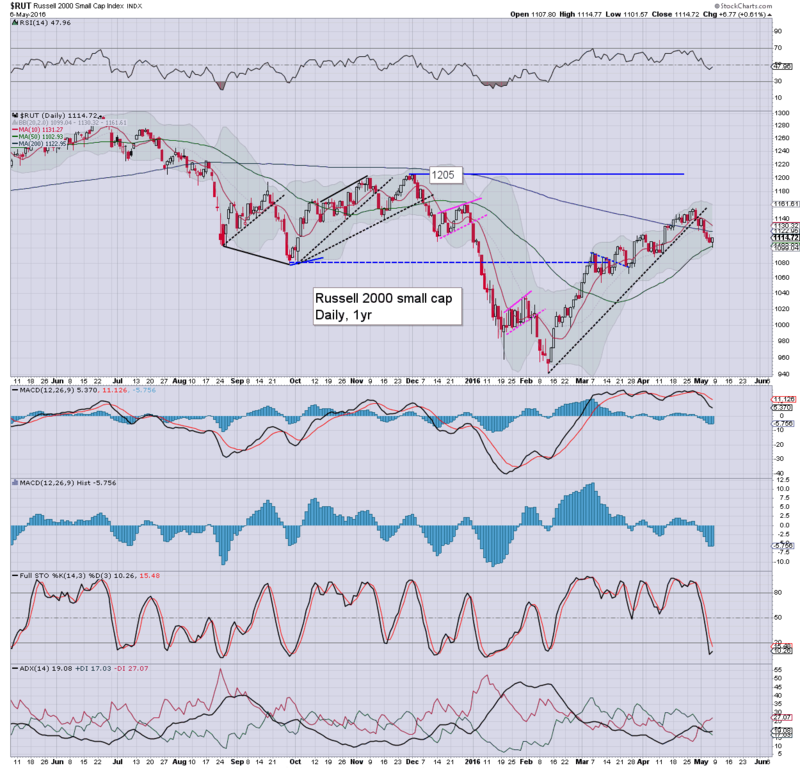 Best case short term downside is the 2000/1990s, before the next sig' bounce of around 3-4%. 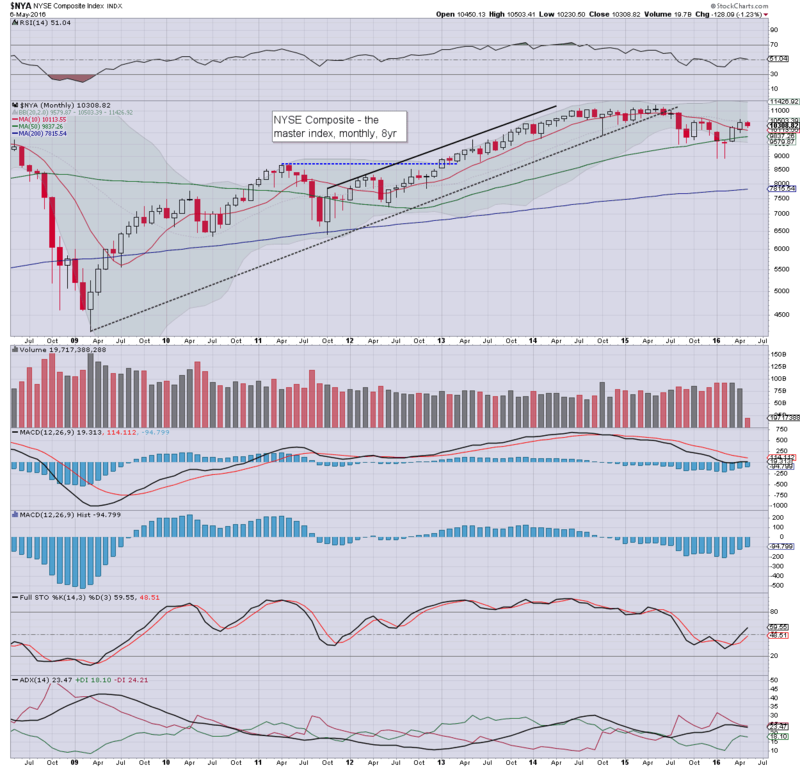 sp'500: a moderate net daily gain, managing to close above the 50dma. The daily candle with a spike floor offers initial upside next week to the 2060s... before next opp' for renewed downside. 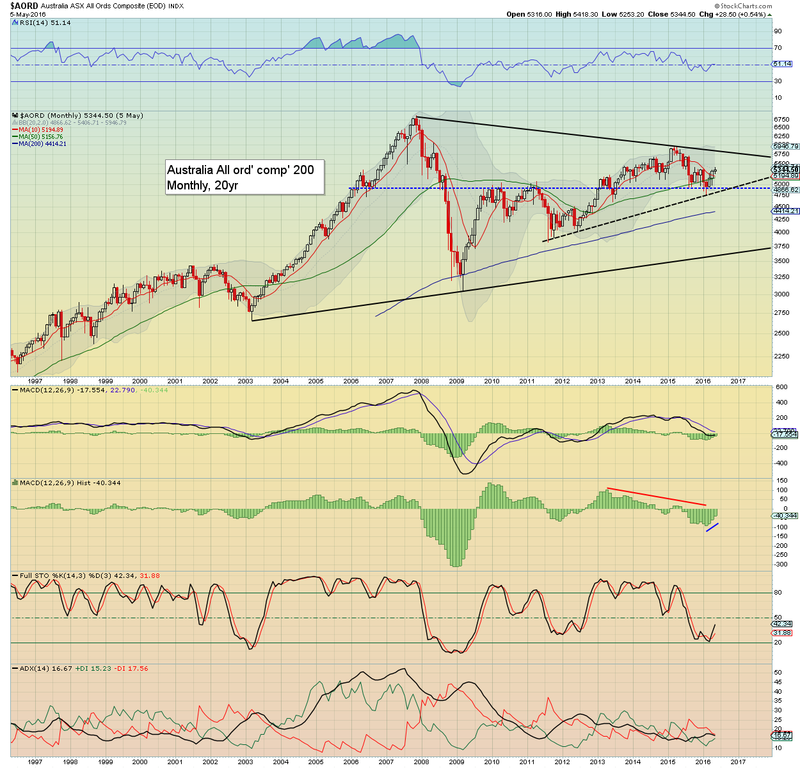 Next support is the 2033 low... from there.. 2000/1990s. 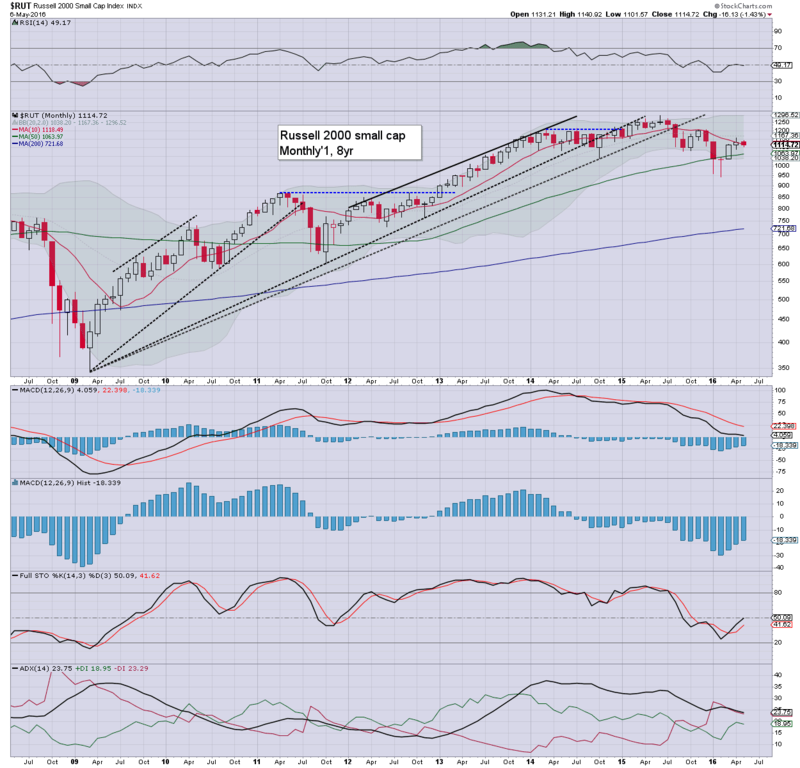 R2K: a test of the 50dma.. and closing with borderline sig' gains. 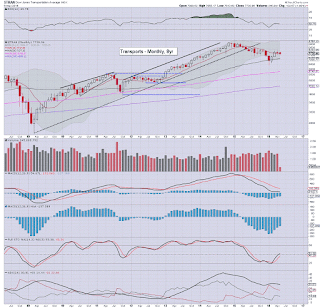 The 200dma and 10ma will offer resistance in the 1120/30s next week. Viable downside to the 1070/50 zone. 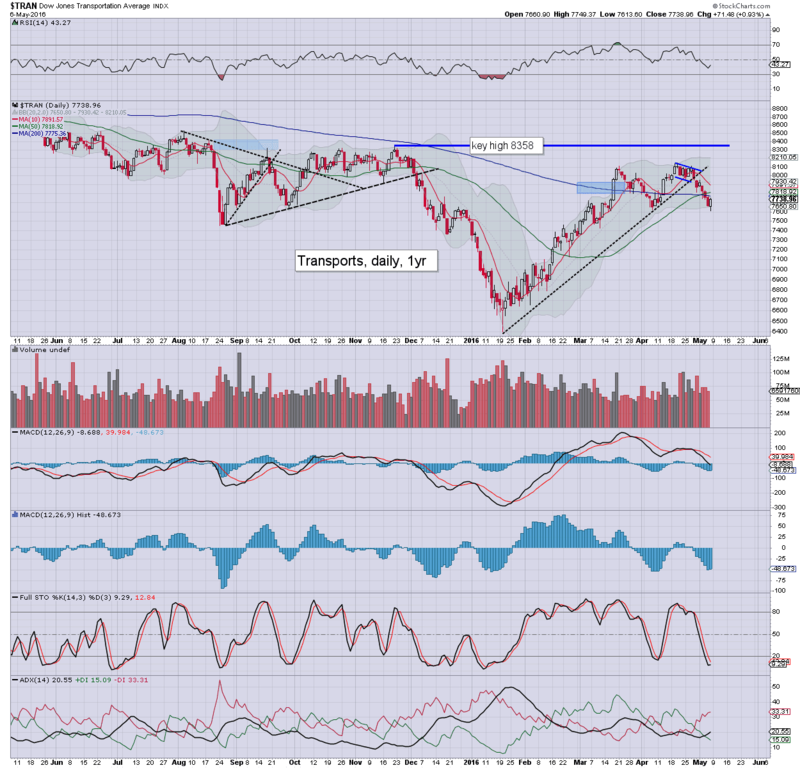 Trans: despite a net daily gain, a weekly close under the 200/50dmas.